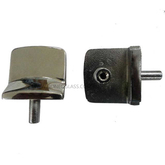 Glass clips are widely used to Hold Glass on the ground or wall strongly. 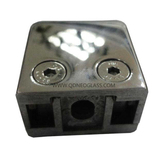 With the requirement from the customers in the glass line and make them convenient, we cooperate with qualified supplier in the line of hardware to provide products with good quality, such as Glass Clip to fix Glass, Hardware for Shower Room,Balcony etc. The finish of the hardwares are qualified and the sizes are accurate. The manufacturer has provided lots of their products for trains domestically and abroad.